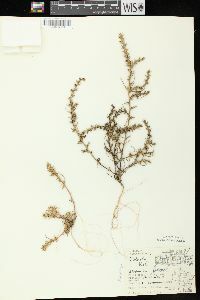 Herbs, (5-)10-100 cm, sparsely papillose to hispid or glabrous. 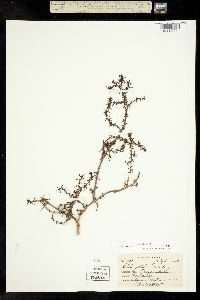 Stems erect, rarely ascending, profusely branched from or near base (rarely simple in underdeveloped specimens); branches arcuate, proximal ones occasionally ± prostrate. 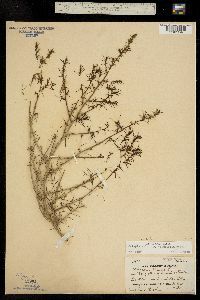 Leaves alternate; blade filiform or narrowly linear, less than 1 mm wide in herbarium specimens, not fleshy, not swollen at base, apex subspinescent (spine less than 1.5 mm). Inflorescences interrupted at maturity (at least proximally), 1-flowered (rarely 2-3-flowered with lateral flowers mostly abortive); bracts alternate at maturity, not imbricate, reflexed, not distinctly swollen at base, ± abruptly narrowing into mucronulate-spinose apex. Flowers: bracteoles distinct or occasionally connate at base in proximal flowers; perianth segments with prominent, membranous wing at maturity (two inner wings usually much smaller than the other three), apex weak, obtuse to weakly acuminate or reflexed, glabrous; fruiting perianth ca. 4-10 mm diam. 2n = 36. Flowering summer-fall. 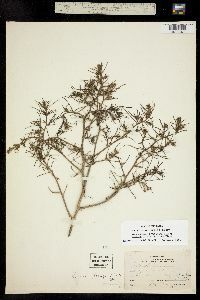 Disturbed areas, roadsides, cultivated fields, coastal and riparian sands, semideserts, deserts, eroded slopes; 0-2500 m; introduced; Alta., B.C., Man., N.B., Nfld. 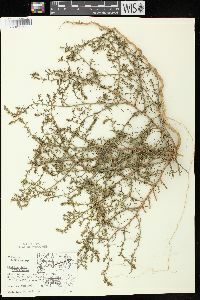 & Labr., N.S., Ont., P.E.I., Que., Sask. ; Ala., Ariz., Ark., Calif., Colo., Conn., Del., D.C., Ga., Idaho, Ill., Ind., Iowa, Kans., Ky., La., Maine, Md., Mass., Mich., Minn., Miss., Mo., Mont., Nebr., Nev., N.H., N.J., N.Mex., N.Y., N.C., N.Dak., Ohio, Okla., Oreg., Pa., R.I., S.C., S.Dak., Tenn., Tex., Utah, Vt., Va., Wash., W.Va., Wis., Wyo. ; Mexico; Eurasia; naturalized Central America, South America, s Africa, Australia. 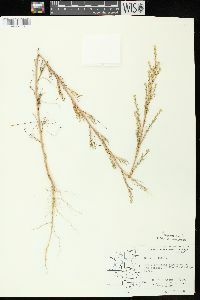 Salsola tragus probably was introduced to South Dakota in 1870 or 1874 in flaxseed imported from Russia (J. C. Beatley 1973c; C. W. Crompton and I. J. Bassett 1985; S. L. Mosyakin 1996). 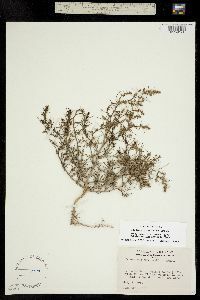 Now this noxious weed occupies almost all of its potential range in North America. It seems, however, to be quite rare in the southeastern part of the United States. 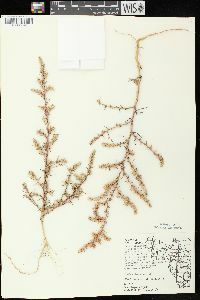 Salsola tragus has been known in North American and European botanical literature under numerous names (for detailed synonymy see S. L. Mosyakin 1996 and S. Rilke 1999). 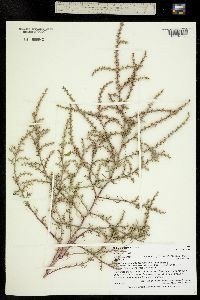 Judging from the photographs of the Linnaean specimen of S. tragus (LINN 315.3), which should be regarded as a lectotype, it is the correct name for the widespread, narrow-leaved, weedy representative of the S. kali aggregate (Á. Degen 1936-1938, vol. 2; N. N. Tzvelev 1993; S. L. Mosyakin 1996; S. Rilke 1999). 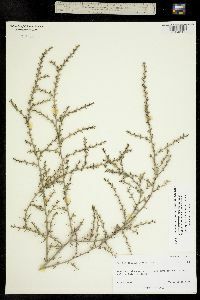 In the present circumscription, Salsola tragus is an extremely polymorphic species consisting of several more or less distinct races (subspecies or segregate species). Several varieties may be recognized within S. tragus, many of them are just morphological variants of little or no taxonomic value. 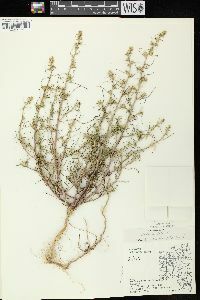 Studies using allozymes and DNA-based molecular markers in some North American and Eurasian representatives of Salsola tragus indicate that there are at least two cryptic genetically divergent populations (F. J. Ryan and D. R. Ayres 2000). More studies may clarify distribution, origin, and taxonomic status of these infraspecific taxa (or cryptic species). 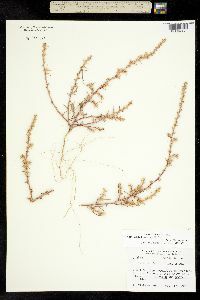 In spite of being a noxious weed, Salsola tragus is an additional forage source for livestock in arid rangelands. 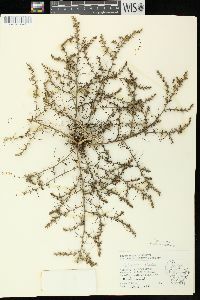 The mature plant may break off at the stem base to form a tumbleweed. 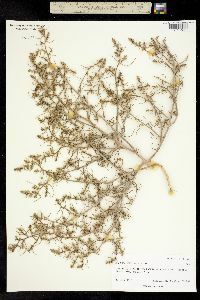 Annual herb, becoming a tumbleweed 10 cm - 1 m wide Stem: upright, much-branched from at or near base, often curved, becoming rigid. 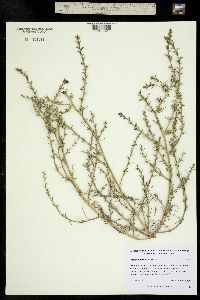 Leaves: alternate, stalkless, 1 - 6 cm long, reduced upwards (eventually giving way to the bracts), thread-like to narrowly linear with a small spine at the tip. Flowers: solitary or few in upper axils, subtended by two small bracts, greenish, small, with five distinct sepals and no petals. Bracts alternate, reflexed, egg- lance-shaped with a spiny tip. Stamens five. Stigmas two. Fruit: one-seeded (utricle), surrounded by the persistent, often winged sepals, 3 - 10 mm wide, subtended by two small bracts and one larger one. Bracts spine-tipped and much longer than the sepals. 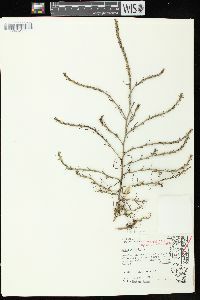 Wall (pericarp) adhered to the seed. Seed horizontal, black, spherical, thick. 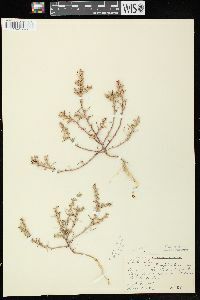 Habitat and ecology: Introduced from Asia. Found in railroad ballast and in sandy soil. Grows along the beaches of Lake Michigan. 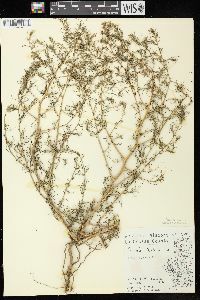 Etymology: Salsola comes from the Latin word salsa, meaning salty. Tragus comes from the Greek word tragos, meaning "hairy part of the ear" or goat. In sandy soil in waste grounds and along beaches and roadsides. Introduced in America.